Multi-connect is an important simplification capability of ConsoleWorks. It gives ConsoleWorks the ability to take one set of commands and send them to as many as 40 like devices. Multi-connect is used for both IT/OT needs, patching or doing firmware updates to servers, routers, switches, IEDs, RTUs, and other assets. It can be used for anything you need to do across a group of assets. Multi-connect directly issues the commands from a master asset to every asset that you put into a group. For example, updating an asset with a security patch or firmware update could be done one asset at a time. If you only have one asset, then you only need to install or push one time. But if you have 20, 30 or even 40 similar assets, then you need to do that same activity 20, 30 or 40 times. Multi-connect simplifies that process. You can issue the command to install or push the firmware or security patch one time. It doesn’t matter what type of IT/OT asset. Multi-connect can patch all of them (at least up to 40) from a single command line interface with a single set of commands. For each like asset in a multi-connect session, you execute one set of commands and ConsoleWorks ensures those exact commands are executed for all assets in the session. 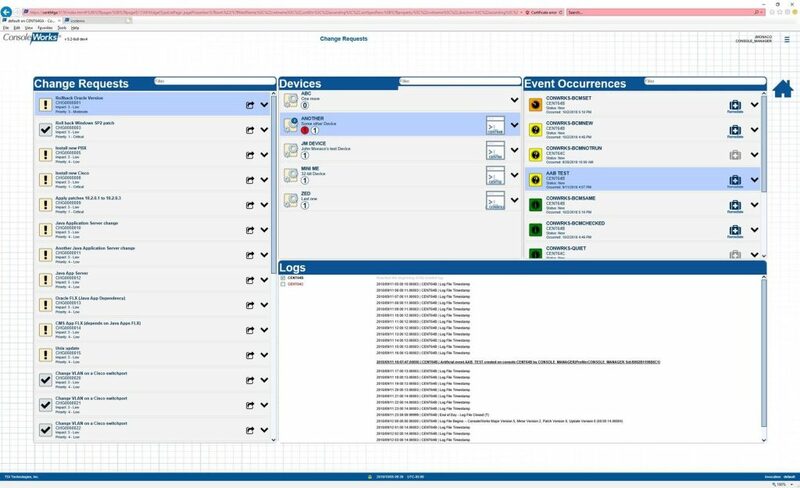 ConsoleWorks then monitors every asset in a group so you can easily address any problems. Additionally, you will have a complete forensic record of the process for every asset automatically captured, time-stamped, digitally signed, and saved for audits, best practices or security review. Multi-connect is a great, innovative way for you to make ConsoleWorks do your work for you when you have groups of like IT/OT devices. One element of configuration management is the recording and auditing of the actual configuration files on IT/OT devices. The first time we document the configuration of a device that becomes the device’s baseline. The baseline is required before an audit can be performed. The most straightforward audit checks the configuration to see if it has changed. More advanced audits use records (approved and assigned changes) from the CMDB or other change management repository, checking to see if the configuration of the device is what it should be. Each configuration change that is supposed to occur (like installing a patch) creates a new baseline. This is often a very manual process. People are involved in each step along the way, connecting to each device to pull down the current configuration and then manually comparing the baseline with the current configuration. They have to check records in multiple places when the audit is checking the “should be” configuration. The process is expensive, it is reactive (it lags actual changes sometimes by weeks or months), it is error-prone and unintentional device configuration changes can impact the overall security practice. There has to be a better way. With ConsoleWorks BCM, configuration data is pulled automatically on a periodic basis. ConsoleWorks uses an agentless, patented approach to managing the IT/OT Infrastructure. ConsoleWorks is connected to the device regardless of its state (i.e. up, down, single user or maintenance mode). The configuration is checked against the current baseline, and any changes between the two are immediately alerted on. Alerts include the exact (keystroke by keystroke) changes between the baseline and the current configuration data. You can also check for differences between devices that are in specific groups (i.e. – they should all have the same security patches installed). Having this capability significantly reduces the time involved in collecting the data required to support an audit and producing the reports to prove compliance. Looking at the Utility industry, in particular, there is a requirement to meet specific NERC-CIP requirements for establishing and retaining a set of secure configuration profiles across hundreds, often thousands, of cyber assets. Manufacturer point solutions exist in a few cases today. However, the limited capabilities vary across manufacturers, and the functionality is inadequate for addressing the basic NERC CIP requirements. ConsoleWorks automates baseline configuration management of all cyber assets from the control room, to the substation, to the pole. It periodically retrieves the current configuration of each monitored asset and compares it to the established baseline. If a difference is detected, an Event is created and logged, and a notification is sent to a designated person for further assessment. Moving from a manual configuration management process to an entirely automated process has many benefits. There is a drastic reduction in cost (man hours), the accuracy of the data and audit findings is dependable and issues can be identified quickly and resolved, typically long before the manual process would even detect that the issue exists. Looking back at the first and second blog in this series, we see that by using ConsoleWorks IEMs the DETECT and ISOLATE steps are completed automatically in milliseconds (effective value = 0) taking a significant amount of time off of our MTTR. That leaves us with Detect = 0, Isolate = 0, Analyze = ?, Remediate = ?. The Analyze step requires that we determine the nature of the real problem. In many cases, the events we start with including the issues described by things like Trouble Tickets are only a symptom of the underlying problems. Regardless of what many of us have been led to believe, Trouble Ticket systems and Event Management Systems often identify symptoms rather than root causes – ask any Admin responsible for dealing with those tickets or incidents. In some cases, the human-readable descriptions from the vendor included in the IEMs will give us enough information to immediately identify the root cause of the problem. In these cases Analyze = 0, netting us an MTTR process of Detect = 0, Isolate = 0, Analyze = 0, and Remediate = ?. In other cases, we need more information which typically pushes us back to our log files to troll through them for the important tidbits (other events) that can help us identify the root cause of the problem. With ConsoleWorks, that log file information has already been captured, stripped of spurious characters (noise), time-stamped, and ordered line-by-line in the same pane of glass so we can quickly zero in on the root cause of the problem. 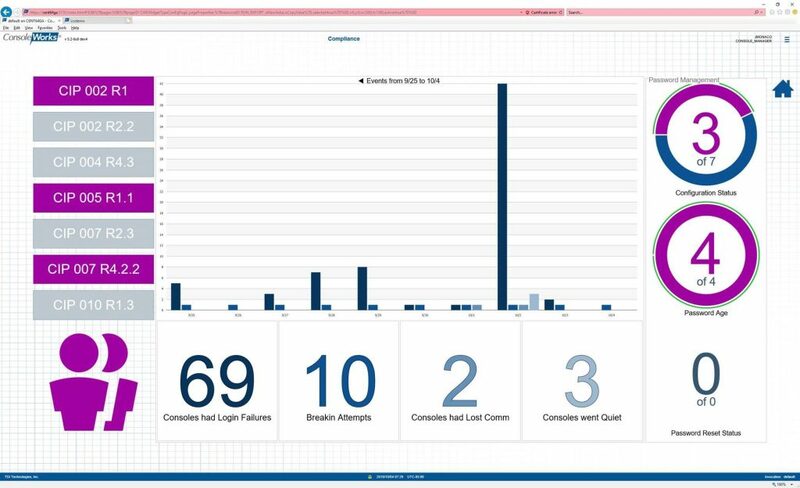 In cases where information from multiple assets is required to analyze the problem, ConsoleWorks lets us bring up processed log information for up to 4 assets side-by-side in our single pane of glass by just clicking on them. Using ConsoleWorks is far faster than trolling through log files or even log file repositories. This takes us to an MTTR of Detect = 0, Isolate = 0, Analyze = 0 to (norm – x), and Remediate = ?